What is the difference between bada and simma? Bada means to bathe, as in being soaked in water. Tub, lake or ocean doesn't matter. Simma means to swim, as in the act of propelling oneself through water or the exercise activity of swimming. All swimmers bathe, but not all bathers swim. Can a non-native speaker hear the difference between bada and båda? For example, if one wants to say "I want both". Or does that have to be "jag vill ha båda". The difference is clear to native speakers, but it's something learners often struggle with. In this case it would be Jag vill ha båda since båda is not a verb, but I would still hear a clear difference between bada and båda. You'll hear it too with practice. 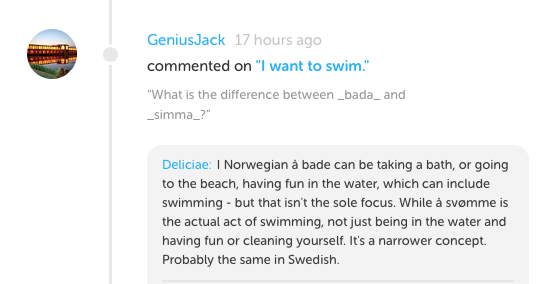 You have so many good replies to questions about Swedish. Thank you many times over for your wonderful explanations! The pronunciation here in DL sounds like [bäda]. So I looked at https://sv.forvo.com/search/bada/sv/ and here you can listen the difference between bada and båda too.